The colored starch grains in an Autochrome plate, greatly enlarged. An Autochrome of the Taj Mahal reproduced in The National Geographic Magazine, March 1921. An Autochrome of the pavilion of Poland in Paris 1925. 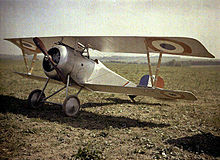 An Autochrome of a World War I Nieuport 23 biplane fighter, circa 1917. House in Stockholm, Autochrome, 1930. The Autochrome Lumière is an early color photography process patented in 1903 by the Lumière brothers in France and first marketed in 1907. It was the principal color photography process in use before the advent of subtractive color film in the mid-1930s. Prior to the Lumiere brothers, Louis Ducos du Hauron utilized the separation technique to create colour images on paper with screen plates, producing natural colours through superimposition, which would become the foundation of all commercial colour photography. 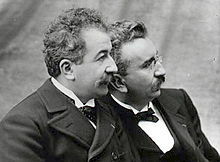 Descendents of photographer Antoine Lumiere, inventors Louis and Auguste Lumiere utilized Du Hauron's (1869) technique, which had already been improved upon by other inventors such as John Joly (1894) and James William McDonough (1896), making it possible to print photographic images in colour. The most broadly used form of colour photography in the early twentieth century, autochrome was cherished for its aesthetic appeal and uniqueness, which have also become its most recognizable characteristics. Autochrome is an additive color "mosaic screen plate" process. 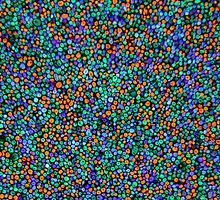 The medium consists of a glass plate coated on one side with a random mosaic of microscopic grains of potato starch dyed red-orange, green, and blue-violet (an unusual but functional variant of the standard red, green, and blue additive colors); the grains of starch act as color filters. Lampblack fills the spaces between grains, and a black-and-white panchromatic silver halide emulsion is coated on top of the filter layer. Unlike ordinary black-and-white plates, the Autochrome was loaded into the camera with the bare glass side facing the lens so that the light passed through the mosaic filter layer before reaching the emulsion. The use of an additional special orange-yellow filter in the camera was required to block ultraviolet light and restrain the effects of violet and blue light, parts of the spectrum to which the emulsion was overly sensitive. Because of the light loss due to all the filtering, Autochrome plates required much longer exposures than black-and-white plates and films, which meant that a tripod or other stand had to be used and that it was not practical to photograph moving subjects. The plate was reversal-processed into a positive transparency — that is, the plate was first developed into a negative image but not "fixed", then the silver forming the negative image was chemically removed, then the remaining silver halide was exposed to light and developed, producing a positive image. The 1906 U.S. patent describes the process more generally: the grains can be orange, violet, and green, or red, yellow, and blue (or "any number of colors"), optionally with black powder filling the gaps. Experimentations within the early twentieth century provided solutions to many issues, including the addition of screen plates, a yellow filter designed to balance the blue, and adjustments to the size of the silver halide crystals to allow for a broader spectrum of colour and control over the frequency of light. Making modern film or digital copies of Autochromes introduces other problems, because a color system based on red, green, and blue is used to copy an image that exists within the red-orange, green, and blue-violet system, providing further opportunities for color degradation. Vintage reproductions of Autochromes in old books and magazines have often been noticeably hand-adjusted by the photoengravers in an effort to compensate for some of the difficulties of reproduction, and as a result they sometimes look more like hand-colored photographs than "natural color" ones. In short, it is very difficult to form an accurate impression of the appearance of any Autochrome image without seeing the original "in person" and correctly illuminated. The lamination of the grains, varnish and emulsion makes autochrome plates susceptible to deterioration with each layer being vulnerable to changes in environment including moisture, oxidation, cracking, or flaking as well as physical damage from handling; Solutions include conservative lighting conditions, chemical free materials, medium-range humidity control of between 63 and 68 degrees Fahrenheit, and a well designed preservation plan. If an Autochrome was well made and has been well preserved, color values can be very good. The dyed starch grains are somewhat coarse, giving a hazy, pointillist effect, with faint stray colors often visible, especially in open light areas such as skies. The smaller the image, the more noticeable these effects are. Autochrome has been touted as “the colour of dreams.” The resulting "dream-like" impressionist quality may have been one reason behind the enduring popularity of the medium even after more starkly realistic color processes had become available. 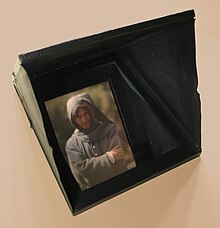 Although difficult to manufacture and relatively expensive, Autochromes were relatively easy to use and were immensely popular among enthusiastic amateur photographer, at least among those who could bear the cost and were willing to sacrifice the convenience of black and white hand-held "snapshooting." Autochromes failed to sustain the initial interest of more serious "artistic" practitioners, largely due to their inflexibility. Not only did the need for diascopes and projectors make them extremely difficult to publicly exhibit, they allowed little in the way of the manipulation much loved by aficionados of the then-popular Pictorialist approach. Autochromes continued to be produced as glass plates into the 1930s, when film-based versions were introduced, first Lumière Filmcolor sheet film in 1931, then Lumicolor roll film in 1933. Although these soon completely replaced glass plate Autochromes, their triumph was short-lived, as Kodak and Agfa soon began to produce multi-layer subtractive color films (Kodachrome and Agfacolor Neu respectively). 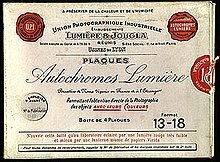 Nevertheless, the Lumière products had a devoted following, above all in France, and their use persisted long after modern color films had become available. The final version, Alticolor, was introduced in 1952 and discontinued in 1955, marking the end of the nearly fifty-year-long public life of the Autochrome. Louise Ducos Du Hauron, "Rooster and Parakeet," 1879. The National Geographic Society made extensive use of Autochromes and other mosaic color screen plates for over twenty years. 15,000 original Autochrome plates are still preserved in the Society's archives. The collection contains unique photographs, including numerous Autochromes from Paris by Auguste Léon from 1925 and by W. Robert Moore from 1936 just before the WWII. The George Eastman Museum in Rochester, N.Y. has an extensive collection of early colour photography, including Louise Ducos Du Hauron's earliest autochrome images and materials used by the Lumiere brothers. In the early 1900s Ethel Standiford-Mehlingan was an experimental photographer and artist and owner of the Standiford Studio in Louisville, Kentucky. She was commissioned by Louisville artist and art patron Eleanor Belknap Humphrey to create an autochrome diascope of her two oldest children. Both the autochrome photograph of the Humphrey children and the diascope mirror viewing device, which closes into itself in a leather-bound case similar in size and appearance to a book, are well preserved and still viewable in 2015. Ethel Standiford-Mehlingan later moved her Louisville enterprise Standiford Studios to Cleveland, Ohio  and it is not known if any other examples of her autochrome diascopes still exist. ^ French patent 339,223, Dec. 17, 1903. Journal of the Society of Chemical Industry, 1905. ^ Hugh Chisholm (1911). The Encyclopædia Britannica: A Dictionary of Arts, Sciences, Literature and General Information (11th ed.). The Encyclopædia Britannica Company. XXI.501. ^ Penichon, Sylvie. Twentieth-Century Colour Photographs. Los Angeles: The Getty Conservation Institute (2013), p14. ^ Lavedrine, Bertrand and Jean-Paul Gandolfo. The Lumiere Autochrome: History, Technology, and Preservation. Los Angeles: The Getty Conservation Institute (2013), p 53. ^ "Color Theory-Autochrome". Home.bway.net. 1906-06-05. Retrieved 2013-01-29. ^ "Collections | National Museum of American History". Americanhistory.si.edu. Retrieved 2013-01-29. ^ M. L. Heidingsfeld (June 27, 1908). "The New Lumiere Process of Color Photography". The Lancet-Clinic. Lancet-Clinic Pub. Co. LXXXXIX (26). ^ Lavedrine, Bertrand and Jean-Paul Gandolfo. The Lumiere Autochrome: History, Technology, and Preservation. Los Angeles: The Getty Conservation Institute (2013), p. 85. ^ Penichon, Sylvie. Twentieth-Century Colour Photographs. Los Angeles: The Getty Conservation Institute (2013), p 61, 78. ^ This term was first coined by John Wood in his book The Art of Autochrome: The Birth of Colour Photography (Iowa City: University of Iowa Press, 1993) and has subsequently become familiar terminology used in reference to autochrome images. Josef Maria Eder, History of Photography (New York: Dover Publications Inc, 1978), 639. ^ "autochromes.culture.fr". The Evolution of the Autochrome - Rise and Fall. ^ McGrath, Jacqueline (1997-03-30). "A Philosophy in Bloom". The New York Times. Retrieved 2008-02-03. ^ Okefuna, David (2008). The Dawn of the Color Photograph: Albert Kahn's Archives of the Planet. Princeton University Press. ISBN 978-0-691-13907-4. ^ History Photographs, Cleveland. "Ethel Standiford-Mehlingan". Encyclopedia of Cleveland History. Education archives. Retrieved 4 December 2015.